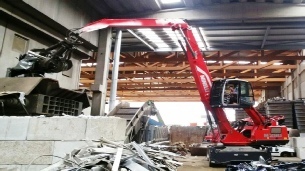 In order to support the varied aspects of the recycling industry, we have recently formed an association with Officine Minelli and can supply their Materials Handling equipment, together with almost any grab device you can think of, courtesy of their cousin manufacturer, Minelli (who we have also just made links with). Together, we can provide a range of machines, to move anything from bulk form or full, solid or semi-solid, as long as it can be gathered and raised. Over half a century ago, Abele, Renato, Vittorina and Francesco Minelli began to design and build Material Handlers: initially equipment for agriculture and moving earth. Today the brother’s vehicles are used every day in the recovery and the reprocessing of a range of materials. Over time, and working with our customer’s needs, we have consistently sought the best solutions to the problem of handling and lifting of materials, offering ever more modern and high-performance models, using increasingly advanced hydraulic systems, proving that every machine is unique because every customer is unique, whilst still maintaining artisan care in details and industrial precision in construction.